My friends and I planned a weekend trip to fish for muskies. 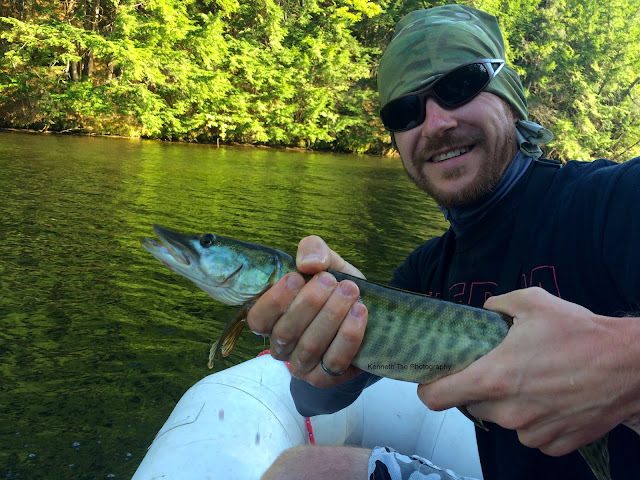 They had never caught a Muskellunge before, but I had a great little known location where they have a good chance of landing their first muskies. We only had a 10-feet zodiac inflatable to float 3 guys. It was a bit packed...but we made the best of the situation. There was a slow leak from the drain plug...so once in a while, we had to put it on shore and drain out the boat. Here's a picture of the boat as we beached it in a little bay after yet another draining session. The fishing wasn't as fast and furious as I had hoped, but we still had the mission accomplished easily on Day 1. On Day 2, we decided to explore a new body of water that I found on GoogleMaps. On our first time fishing there, we found lots of great areas, almost too many locations to fish. At this one location, I had a mid-30" fish jumped off beside the boat. On our way back to the launch, we tried the spot again and this time I landed my personal best muskie at 32". I've been fishing for muskies for a few years, mostly in smaller bodies of water that allow me to know these systems intimately, but the potential for big muskies are low. Hopefully, a 40"+ muskie is not too far away. We were originally planning a Day 3. However, with the weather calling for rain from evening lasting to morning, my friends decided to go home early instead. Waking up early on Monday morning, I arranged with my friend Matthew so he can check out a travel rod he was planning to purchase. I just so happened to have that rod at home. As we were chatting at my apartment, it simply looked too beautiful outside sitting at home for the day. 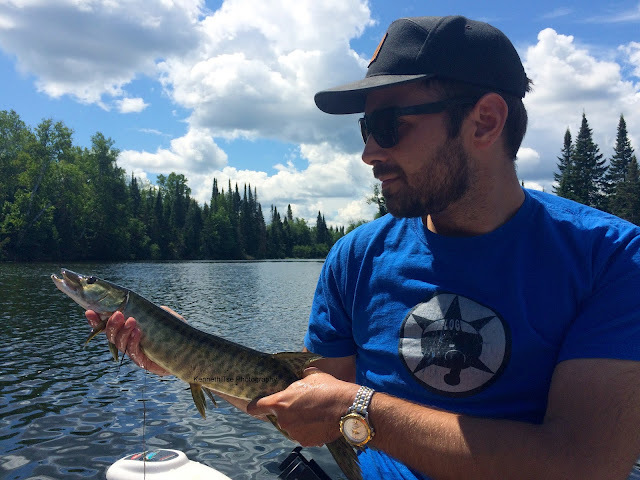 Matthew had wanted to fish for muskies with us on the weekend, but he had a family event on Sunday and he wasn't able to join us. 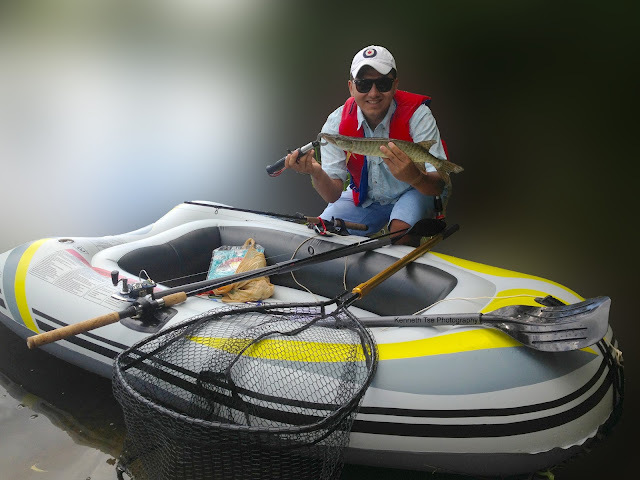 I really wanted to help Matthew catch a muskie before he goes off to school in Ireland in September, but we didn't have any watercraft to get us floating. 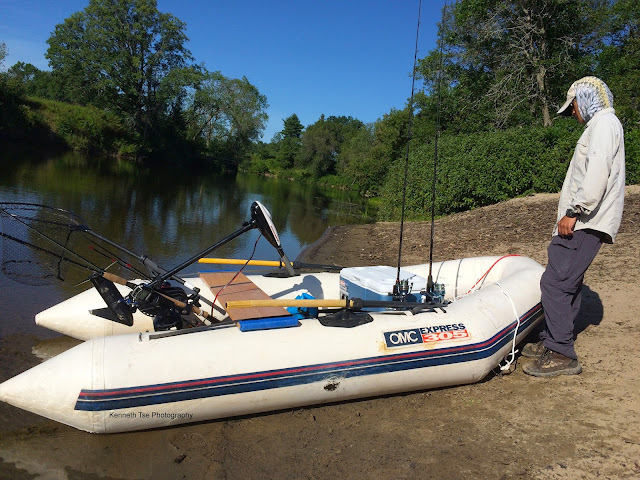 In a moment of genius and insanity, we explored the idea of purchasing a small inflatable boat. This wouldn't be much more than the typical beach toy. In fact, the one we purchased was just large enough for 1 adult and 1 child. Luckily, I weight almost nothing. With the boat seemingly buoyant enough, we gave it a test ride but quickly turned around to fill the tubes with more air. We were sitting a little low in the water. Finally, after about 45min of preparation, we were ready for the maiden voyage. We pushed off the little boat and paddled just a minute before I suggested to Matthew to start casting. Man, we were so stoked!!! We kept fishing down the shoreline. Another hour later, I lost a high-20" fish beside the boat. It was tough netting the fish low to the water and minding the trebles ever so close to the side of the boat. 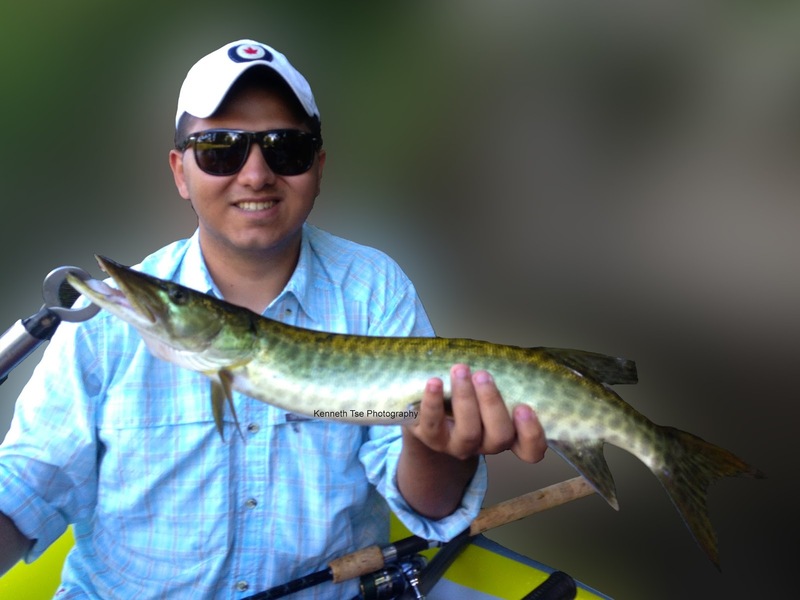 Giving this section of shoreline another drift, Matthew landed his second ever muskie! The wind had switched direction and increased in strength. Being mindful of our little craft, we had to call our fishing session. We were only on the water for 3 hours, with about half our time paddling our beach toy getting to out spots and positioning the boat. 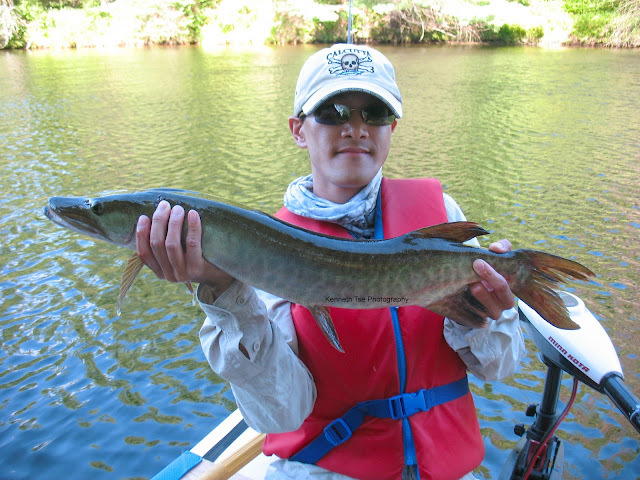 It was pretty amazing we actually landed 2 muskies and lost 1 on a beach toy! 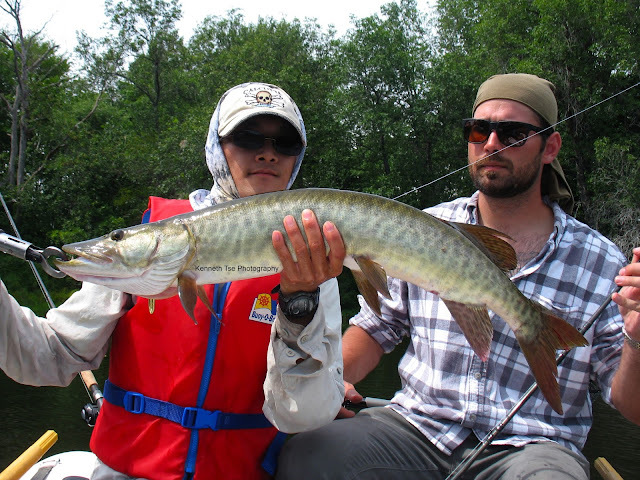 Yes, they are small muskies, but not many people can actually say they have accomplished this feat! Welcome to my blog. I wish to share my traveling and fishing adventures with like-minded travelers and anglers of the world. I hope you enjoy the adventures and the photography. Schogsky and Hutch : Fishing Adventures!